The institutions of the Government of Macedonia organised series of events on Saturday for the observation of Macedonia’s Independence Day, 8 September. On this day back in 1991, the citizens of Macedonia voted in a referendum whether they want Macedonia to become an independent state, or remain in alliance with Yugoslavia, with 95 % of the citizens supporting independence. 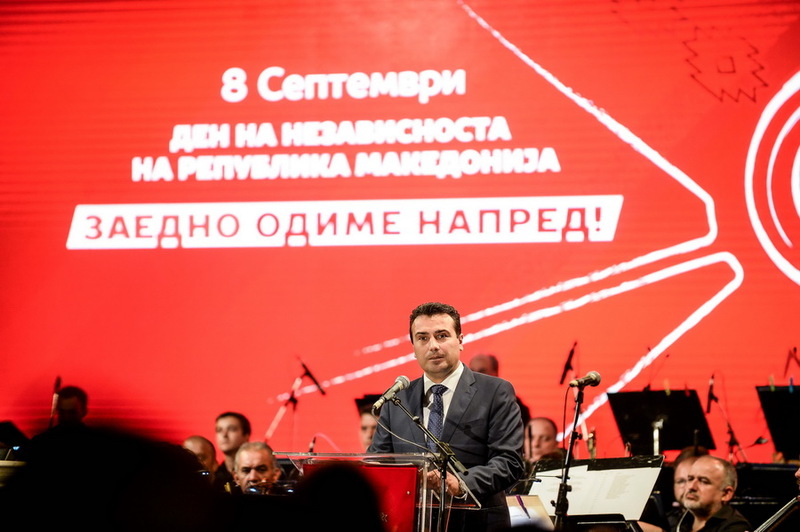 During a concert held for Independence Day on Saturday evening, PM Zoran Zaev came to the stage to address the citizens, congratulating them on Macedonia’s independence, and asking for their support for the upcoming 30 September referendum. “This is a historical moment, greater than any political party, greater than our disputes between each other. Let us put our differences aside and head towards Europe that opens its doors for us. On this day 27 years ago you made the most important decision in the history of Macedonia, and now time has come for another decisions of same importance. Now, like never before, we have an opportunity to secure our place in the great European family, so I call upon all of you, young and old, men and women, of all ethnicities, religions, political affiliations, to vote in the referendum on 30 September, and secure a brighter future for yourselves and generations to come. True patriots respect their country’s past, but they are looking ahead in the future,” Zaev told the citizens. During the day, many politicians, state officials, political parties and associations sent their greetings to the citizens for Macedonia’s Independence Day.